The patrons and staff of cardiac rehabilitation at Morriston Hospital welcomed W.Bro. Ray Harris and W.Bro. Phil Crayford to the unit on May 25th 2015 where a cheque for £840.00 was presented to assist the unit in the vital work it has carried out for the last 15 years. The charitable donation from the Old Goreans Lodge had largely been raised from raffles held at the regular lodge meetings and the annual Charity Stewards Sunday Lunch held at Sketty Hall. A number of Old Goreans Brethren have been receiving treatment at the hospital recently and the “The Cardiac Health Team” was thought to be a very worthy recipient of the current Worshipful Masters chosen Charity for his year in office. At the regular lodge meeting held on Saturday 15th November 2016, W.Bro. Anthony James Davies received his Masonic Veteran’s Certificate from Province which was presented in an eloquent address from W.Bro. Robert J. Nettleship PSGD, PGStwd, PAPGM, who has been for many years a fellow chorister with W.Bro. Tony in the choir of St. Mary’s Church in the City centre where W.Bro. Tony has been a member for 57 years . W.Bro. Tony was Initiated into the Old Goreans Lodge on 12th November 1966 and has been a stalwart of his Mother Lodge ever since, progressing through all the Offices of the Lodge, becoming the Master in 1978 when he hosted the Annual Federation of Schools lodges meeting in Swansea and where he held the office of Lodge Almoner for 11 years. Owing to the fact that he attended the school as a pupil in 1953, W.Bro. Tony was the “Past Master” called upon to write a short History of the Bishop Gore Grammar School and its connections with the Lodge for the celebrations held to commemorate the 50th Anniversary of the the Lodge, having been consecrated on the 5th June 1952. Dr. Anthony James Davies Bsc. had a brilliant academic career as a professor of Physics in Swansea University where he became the Head of the Department of Physics after a period of time when he lived in Geneva where he was a Fellow and a consultant to the Linear accelerator group in CERN. He was the Pro Vice Chancellor of the University from 2000 until his retirement in 2002. He is currently the secretary of “Llwchwr Probus club”, the Treasurer of “Swansea Back Care” and an Ambassador for “Discovery” the Student volunteering organisation in Swansea. He has been married to Margaret for 52 years, has two sons and nine grandchildren all of which keep him fully occupied amongst his other interests. W.Bro. Tony is a loyal and a constant supporter of the Old Goreans Lodge and long may he continue to enjoy his time spent in the Fraternity. WM Presents Bro. Alan Thomas with his 40 year lapel pin. 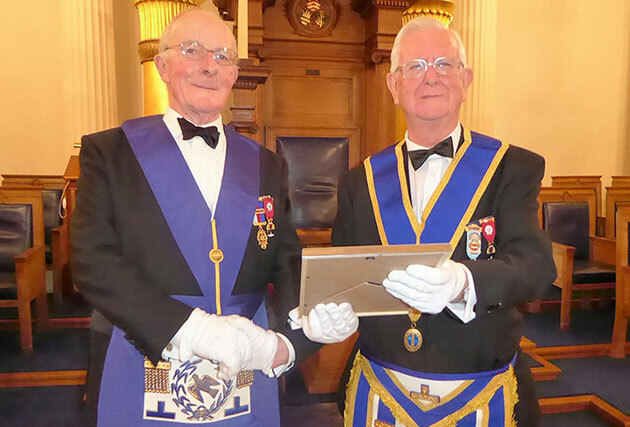 Our WM Ray Harris accompanied Brother secretary on his usual visit to present Bro Alan with his Lodge summons and Minutes, and on this occasion Bro Alan had reached the significant milestone of 40 consecutive years as a Freemason in the Old Goreans lodge. 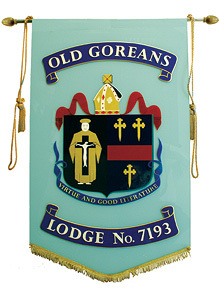 Bro Alan has been a stalwart of the Old Goreans and is its longest serving Steward. All of the Brethren miss Bro Alan since the severe stroke he suffered in 2012 has prevented his attendance at lodge, although he maintains contact with the Brethren and enjoys wading through “Y Dalaith” to keep up to date with what has happened within the Province. 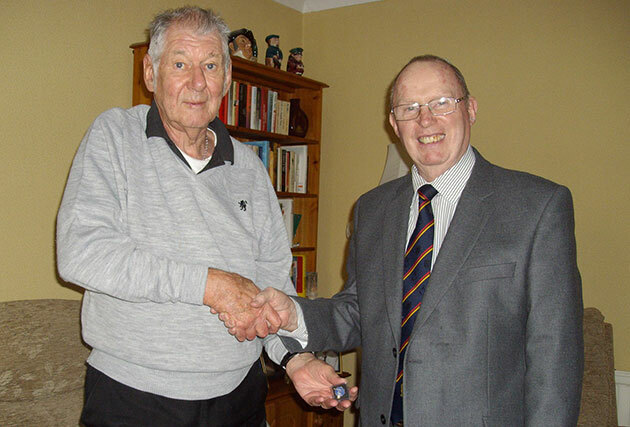 The photograph shows a surprised and delighted Bro Alan being congratulated by W.Bro. Ray at his home in Dunvant.